Aim Consulting delivers award-winning IT consulting services that focus on the human side of technology. They work to solve critical business challenges for their clients, helping them delight customers, empower employees and drive innovation forward. 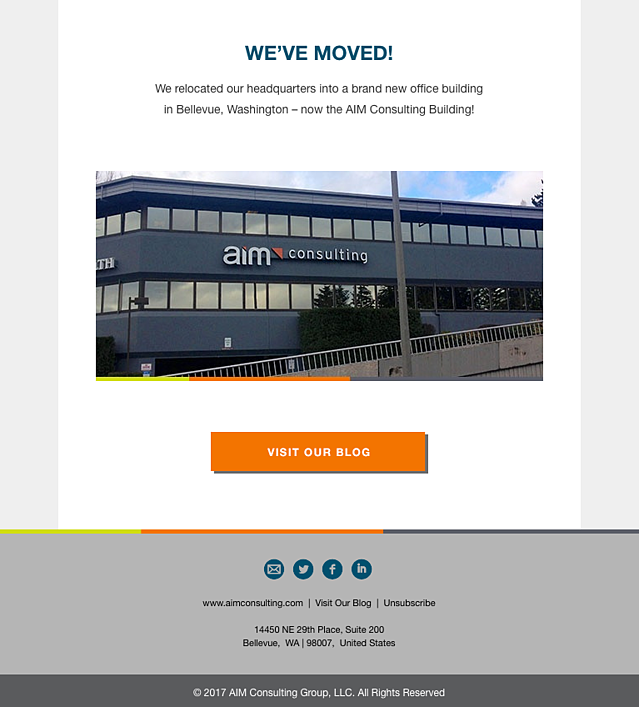 With offices in Seattle, Minneapolis and Denver, the AIM Team is ranked among the fastest growing private companies and the best companies to work for, with a long track record of success with a variety of clients across the US. 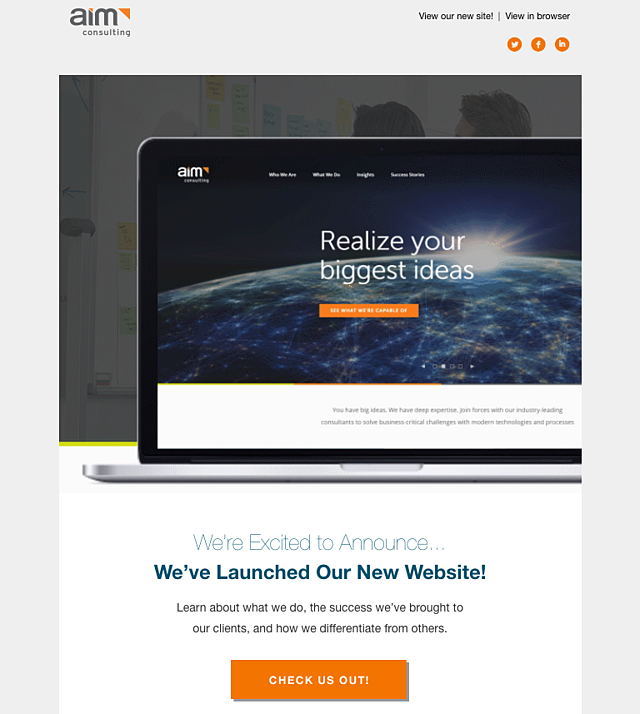 The team at AIM was tired of boring email templates. They wanted something that would showcase their new website design and a fun way they could show off their 2016 numbers. They wanted a unique and appealing way to entice their contacts to click through to their new website. They wanted recipients to be impressed by the email, actually read through the numbers and then visit the site. They also knew they wanted some type of animation included that aligned with the fun spirit of their organization. 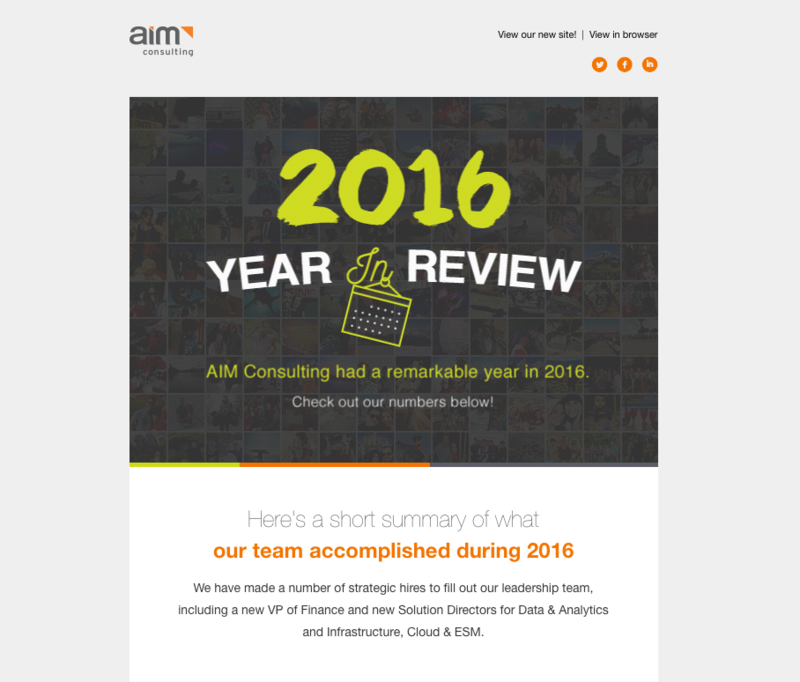 They selected ManoByte to help them create this unique email promoting their new website and their 2016 successes. When it came down to it, AIM had a lot of content they wanted included in one email. Our team suggested that it would be a better idea and best practice to spilt the long email into 2 separate emails to encourage more engagement and higher click-through rates. We started by creating one email for their new website that included a moving .gif in the header image. The header showed a laptop computer with their new website in the screen that moved through the hero images of their new site. We then shortened the email and included a CTA leading them to the new site. 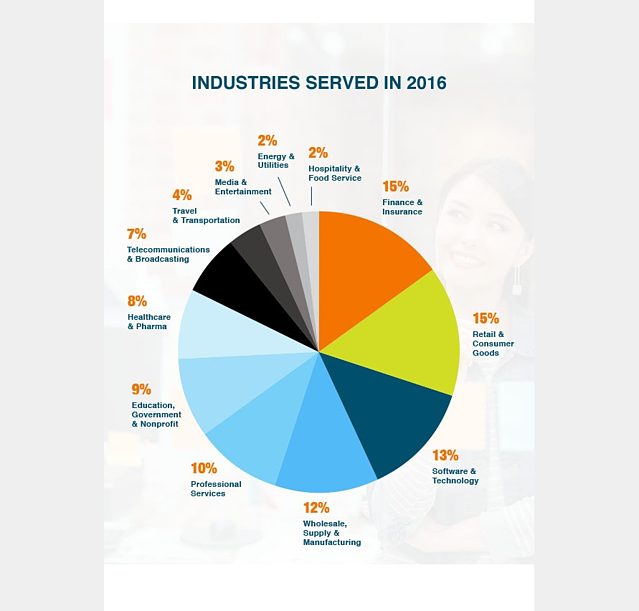 The second email focused more on a "year in review" and showcased a pie chart and sections of different important 2016 numbers. The header also included a .gif that was intended to catch the recipient's eye with a swinging calendar hanging off the text. So far, we've sent 1 of the 2 emails out to their contact database. The first email, which was the new website email, resulted in a 61.51% open rate and a 9.2% click-through rate. The second email is set to send in the next few weeks - so stay tuned! 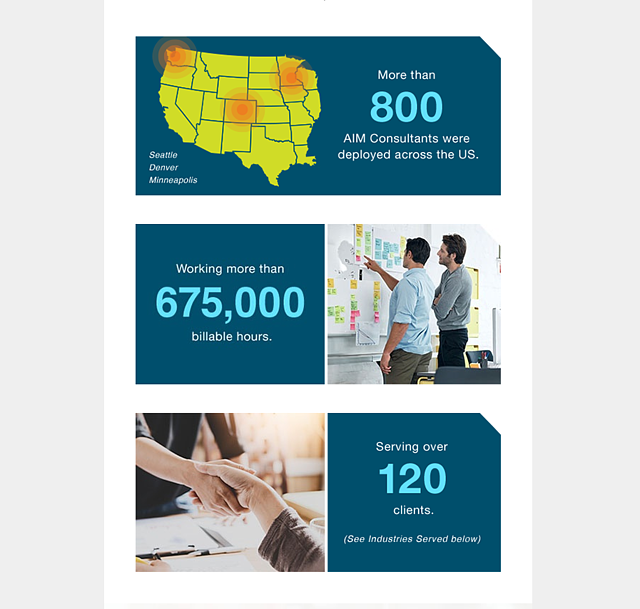 When asked about how they felt about the results of the work ManoByte completed for this campaign, Amy Stewart at AIM had this to say, "AIM is built on real, human-to-human relationships. We don’t do a lot of email blasts, so we wanted this singular effort to create a positive impression of the brand and leverage modern email design trends (cinemagraph) to elicit a sense of delight without being too gimmicky. ManoByte has proven to be a knowledgeable, responsive, talented, and creative partner for Hubspot-based design and development work. I provided the intent, brand guidelines and content, but no sense of how the email should be designed. They came back with great ideas that required only a few tweaks to finalize. I am very satisfied with the emails they designed and developed. They are really beautiful and do credit to our brand."